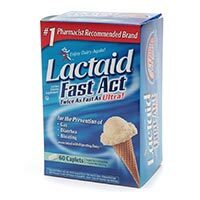 LACTAID Fast Act is the most convenient LACTAID Supplement that's perfect at home or dining out. Simply have one LACTAID Fast Act with your first bite of dairy food and enjoy! It's available in easy-to-swallow caplets and delicious Vanilla Twist-flavored chewable tablets and can be used every day, every time you eat any dairy food. You must click on this offer to get the printed coupon.